TWO OF THE four Marines shown apparently urinating on dead Taliban fighters in an online video have been identified by authorities, as the US races to contain fallout from the incident. Military police investigators have now interviewed the two soldiers whose identities could be confirmed. It’s not known what penalties they could face, although US Defence Secretary Leon Panetta has warned that anyone “found to have engaged in such conduct will be held accountable to the fullest extent”. According to the New York Daily News, all four were members of a sniper team with the 3rd Battalion 2nd Marines, based in North Carolina. A Taliban spokesman has called the video “barbaric”, and claimed that there were hundreds of similar incidents which had gone unreported, according to the Herald Sun. The US is currently seeking to enter peace talks with the Taliban, possibly in a third-party nation such as Qatar. According to the New York Times, US officials have been meeting with representatives of Taliban leader Mullah Muhammad Omar for months in the hope of finding a route to sit-down talks. Yesterday top officials in the US military and civil administrations condemned the video in an effort to stop negotiations being derailed. Panetta said the acts apparently depicted were “deplorable”. On the streets of Afghanistan, the reaction was cool. “If these actions continue, people will not like them (the Americans) anymore and there will be uprising against them,” Mohammad Qayum, said while watching a television news story about the video that was airing in a local restaurant in Kabul. Email “'Urinating on dead' video: US soldiers identified as fallout continues”. 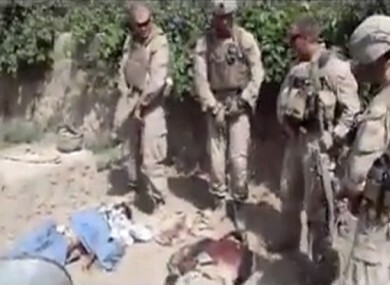 Feedback on “'Urinating on dead' video: US soldiers identified as fallout continues”.